Steve and I have been enjoying Halloween costume parties with my Dad, George, for six years. This year, George is less mobile than other years, so we designed a costume that incorporates his wheelchair. The characters from the Wizard of Oz movie fit the bill. 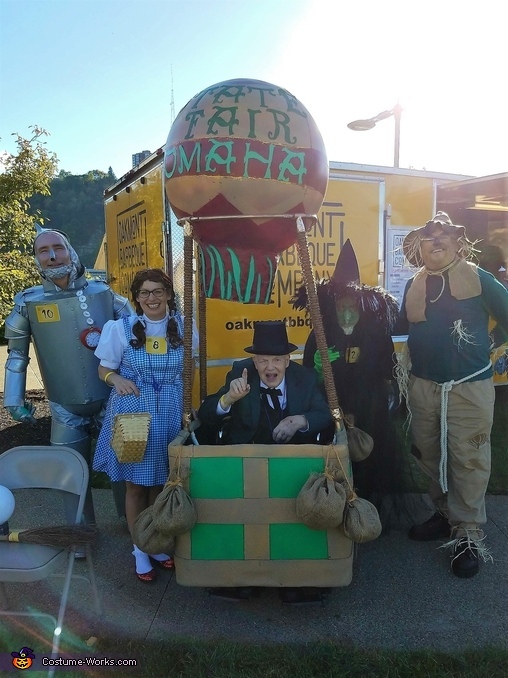 George was the Wizard, in suit and Colonel tie, riding in the Omaha State Fair balloon. With our friends, Judy and Dan, we added the Wicked Witch of the West, the Strawman, Dorothy and her little dog, and the Tin Man. For the hot air balloon, we used EVA yoga mats, bent around a frame made of PVC pipes. The PVC pipes, a hula hoop, and rope twine were used to make the balloon ropes, to which we added battery-powered fairy lights. A large beach ball and parts of a laundry basket were used for the balloon. Burlap was used for the ballast weights. The tin man costume body was made of various sizes of HVAC sheet metal duct tubes. After overheating in a plastic painter suit, Steve dressed in a gray morph suit. As in the movie, a funnel was used for the hat, another part of a funnel formed the nose, and pop rivets, paper rivets, and duct tape held it all together. The hot air balloon and tin man costume took about three weeks to make. The witch used paint and latex to create her face. Dorothy found the perfect slippers and wig to complement her dress. The scarecrow made his hat from felt and straw to fill his body. Our first party was an inaugural event at the Pittsburgh casino, on October 7. It was an outdoor event on an 83-degree day; hence the tin man overheating. This was followed by five more events, from October 21, 26, 27, 28, and 31. At each party, the Wizard would hand out chocolate hearts and diplomas (brains). We were totally exhausted by Halloween night, but winning 6 out of 6 was very gratifying.